Kokusai Dori is the name of a 2 km stretch of shops, hotels, bars and restaurants which cuts through the heart of downtown Naha, the largest city in Okinawa. The street’s name in English is International Road, supposedly named after the Ernie Pyle’s now-closed International Theater, which was a popular movie theater for U.S. troops during the occupation of Okinawa following World War II. Before the war Kokusai Dori was just a dirt path through swampy fields, but during the postwar reconstruction, it became of symbol of Okinawa’s quick revival, earning it another name — Miracle Mile. 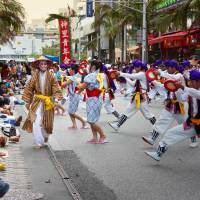 Regardless of what you call it, a visit to the street is virtually essential for tourists in Okinawa. On any given day, one of the largest tourist demographics on the street are Japanese students visiting Okinawa on school trips. They keep hotel rooms full and souvenir shops crowded, but the street is no less appealing to the more mature and independent tourist. It provides a multitude of places to drink, dine, enjoy Okinawan music and buy souvenir’s — everything from cheap bead bracelets sold by street vendors to exquisite and expensive coral statuary in high-end jewelry shops, to traditional glassware and pit vipers pickled in alcohol. Kokusai Dori, like Las Vegas, never really sleeps. Many shops stay open until 11 p.m., which is when bars are starting to fill up, and these drinking holes often stay open until 5 a.m., when the street cleaning crews, delivery vans and trucks take over. By 10 a.m. the street is once again bustling with tourists and local shoppers. 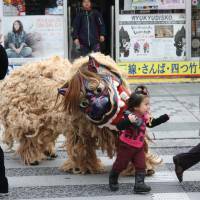 This pattern changes on Sundays, when the street is closed to traffic and opens up to dancers, fire-eaters, street performers and children, who can use an open-air play area created for them in front of the Kokusai Dori Starbucks Coffee shop. 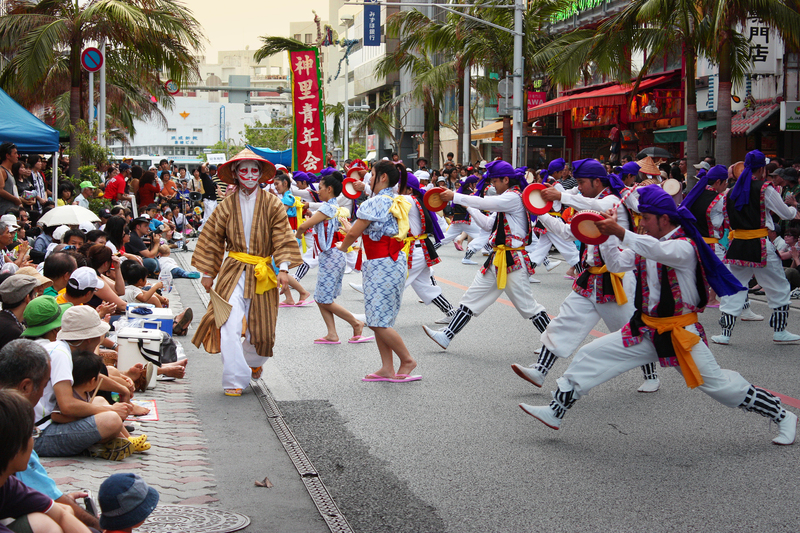 These customs come to life at various times throughout the year, when the street hosts parades and festivals such as the Eisa folk-dance festival in summer, the Shuri Castle Festival in autumn or the Uchinanchu Taikai (Okinawan Reunion) Festival, held every five years to welcome the global Okinawan diaspora back to their ancestral homeland. 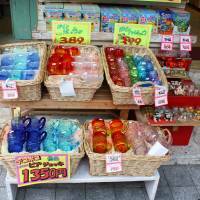 Ryukyu glass dates back to the Meiji Era (1868-1912) when it took the form of medicine jars, bottles and wells for oil lamps. 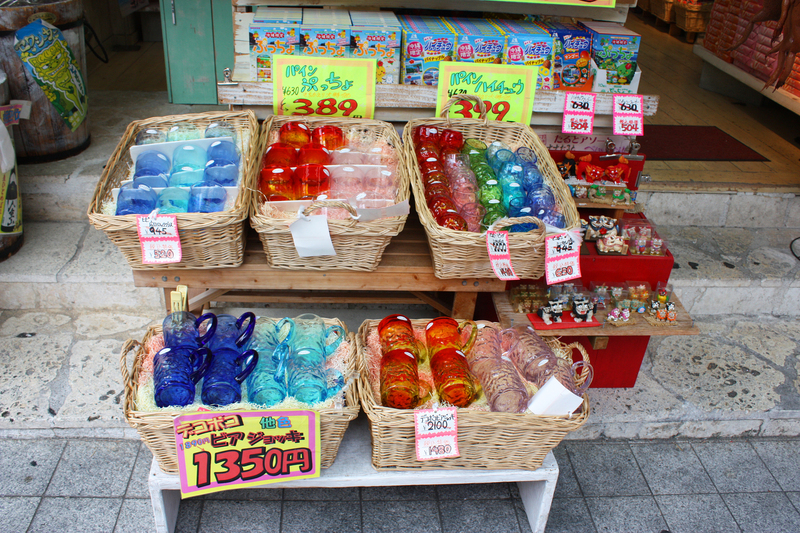 During the Occupation of Okinawa following World War II, glass craftspeople began to produce goods for U.S. soldiers by applying their traditional skills to the discarded bottles of the occupying army, and today, local craftspeople are still producing glass goods with recycled beer and juice bottles. They create beautifully colored glassware by adding various minerals to recycled bottles, which they have liquified in kilns heated to 2,000 degrees Celsius. Various minerals are then added to this molten glass to give it its characteristic colors: Light blue is made by adding oxidized copper; cobalt oxide for dark blue; manganese oxide for purple; and red, the most popular color, comes from adding oxidized silver selenium. Brown glass is made by using old bottles of Okinawa’s infamous awamori liquor (an alcoholic drink distilled from long-grain rice) and the rare, colorless glass items are made from sheet glass. For a textural effect, calcined soda can be added to produce bubbled glass. 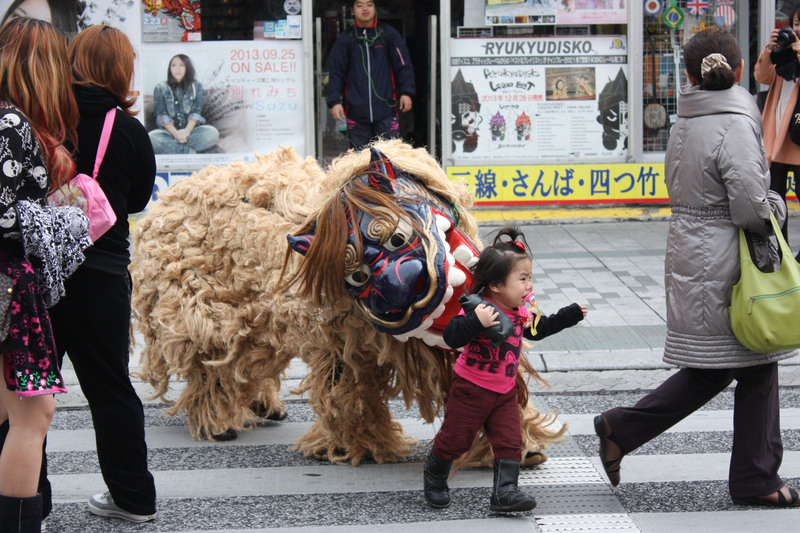 One of the most ubiquitous item on Kokusai Dori is the shisa, a mythological lion-dog statuette, used to protect homes against evil. While most shisa are ceramic, the larger examples are sculpted from Okinawan limestone and pairs of them stand guard over the entrances to Kokusai Dori. Shisa are almost always sold in pairs: One has its mouth closed — possibly keeping out evil … or is it keeping in the good in? — and the other has an its mouth open, sharing goodness … or rather, is it scaring away evil? No one can quite agree. The sanshin, a traditional Okinawan three-stringed instrument (sanshin literally means “three strings”) came to the Ryukyu Kingdom from China about 600 years ago and is derived directly from the Chinese sanxian instrument, which also means “three strings.” The body of the sanshin is made of snakeskin, the neck of ebony, rosewood, oak or ironwood, and the bridge from bamboo. During the early days of the Occupation, when times were tough, Okinawans made three-stringed instruments from tin cans called kankara (“from cans”). Also, the sanshin is the ancestor of the Japanese shamisen (also meaning “three-strings”) which reached Japan about a century after the sanshin came to the Ryukyus. The instruments are almost identical but the shamisen is made from cat skin. Similar to, and inspired by, the Hawaiian aloha shirt, the Okinawan kariyushi shirt — kari means “lucky” and yushi means “come near” — became popular in 1970 when short-sleeved cotton shirts with traditional Okinawan images or simple floral patterns, were worn by members of the Okinawa Hotel Association. In 2011, when the Japanese government created Super Cool Biz — a campaign which reduces energy consumption by encouraging informal wear in the summer months — kariyushi shirts became popular again throughout Japan. 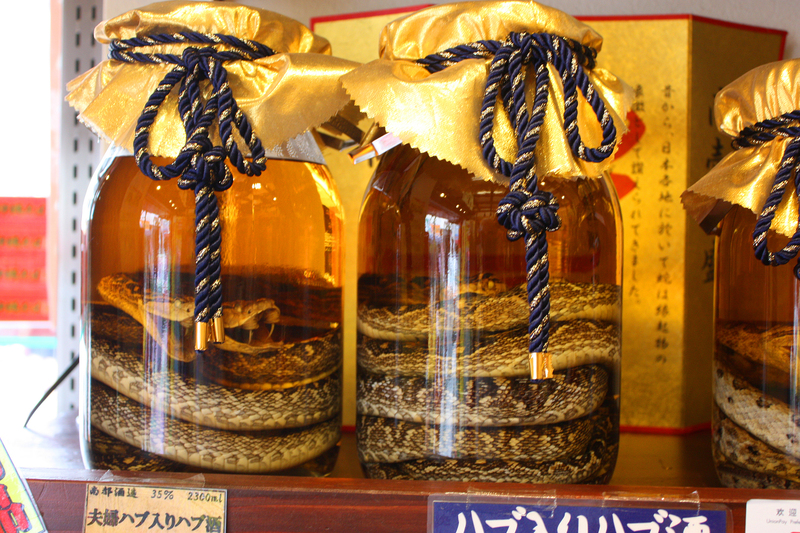 Undoubtedly the most bizarre item to be found on Kokusai Dori is habushu, a liqueur containing poisonous pit vipers known as habu. Habushu is made with a base of awamori, to which ginseng, herbs and honey are added for coloring and flavor. Finally the poisonous snake is placed into the alcoholic liquid. 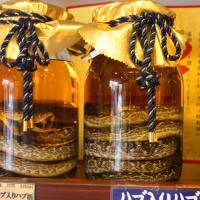 This practice is certainly cruel — the live snake is either drowned in the alcohol or sedated, gutted, bled and sewn back up before being placed in the gallon jar. Once the sedation wears off the snake briefly revives and strikes before dying, which preserves an aggressive fangs-exposed posture. The latter method also eliminates the obnoxious odor of the habushu’s organs. Like grilled unagi (eel), habushu is believed to increase sexual potency, since the snake can mate for up to 26 hours at a time. As for me, I’ll stick to the unagi, thank you. A healthier and more benign Okinawan product found along Kokusai Dori is beni imo, or purple sweet potato, which is offered either roasted whole or in a variety of sweets, ranging from tarts to soft ice cream. The popular Okinawan comedian Gori, of the comedy duo Garage Sale, promotes the potato by wearing a beni imo tart costume in posters around town and on television commercials. But any way you eat it, beni imo healthy; they are reported to have 150 times more antioxidants than blueberries and their purple color comes from anthocyanins, which are supposed to reduce cancer. As far as shopping goes, locals will tell you it’s worth walking down to the far end of Ichiba Hon Dori, one of the three covered shopping streets off Kokusai Dori that leads to a farmer’s market selling fresh, locally-grown fruits and vegetables, and prepared seafood products at far below the prices found on the Miracle Mile. Nightlife also plays an important role on Kokusai Dori and Canadian Paul Patry is a major player. Paul owns the Rehab International Bar, right in the heart of International Road, as well as the RIZE Restaurant, which has a great view of the bustling street below. When US military personnel were restricted from drinking off-base after dark in 2013, Paul renovated his Rehab Bar with the aim of attracting young Okinawans and tourists to replace the lost customer base formerly provided by soldiers, sailors and Marines. Paul — a man who once sailed from Hong Kong to Okinawa during a typhoon aboard a 46 foot catamaran — was able to open Rehab with tachi nokii compensation money given to him by the city of Naha, after they tore down the building which housed his previous bar, Paul & Mike’s. In its place they put up a modern shopping complex; Kokusai Dori is always in a state of flux. Okinawa’s beautiful white sand beaches and reefs, rife with colorful fish, will certainly attract most visitors to the island, but Kokusai Dori offers something different. It isn’t only an essential stop on the tourist trail, culturally, Kokusai Dori is a kaleidoscopic microcosm of traditional Ryukyu customs and international urban culture. Getting there: Kokusai Dori Street is located in downtown Naha, Okinawa. It can be reached via Makishi Station on the Okinawa Monorail. Daily flights leave most major Japanese cities for Naha.